Rivfest is back for its 3rd Year. For the first time the event will take place across 2 days in multiple venues around Warrington’s Cultural Quarter. In another first for Rivfest, a new Friday night showcase has been introduced at the Parr Hall to provide a platform for some of the Northwest’s hottest new Indie acts. Friars Court – The Lounge – The Acoustic Cafe – The Auction Rooms – The Old Town House – Hernando’s Hideaway – The Volstead – Hop Co – 9Gallon, plus a special fundraising event hosted by Appleton Village Hall. All of the stages exist to provide a platform for emerging talent and for the acts who are already beginning make themselves heard. A hand-picked selection of the finest North-West emerging talent. FICKLE FRIENDS, Fuzzy Sun, The Mysterines, Dantevilles, Mo Jamil, Joe Hill, The K’s, Y.O.U.N.G, Chambers, Pale Seas, Saytr Play, Atlas Bay, The Ambersons, Ferris and Sylvester, Sunstack Jones, The Sunset Beach Hut, The Strawberries, Kashmere, Witch Fever, Black Pudding, Spilt, Serratone, Scruffy Bear, Gravves, Plastic, Nutty Skunk, Same As It Ever Woz, Midwich Cuckoos, No More Idols, Secret Admirer, Peter and the Werewolf, Twin Falls, The Last Resorts + many more. 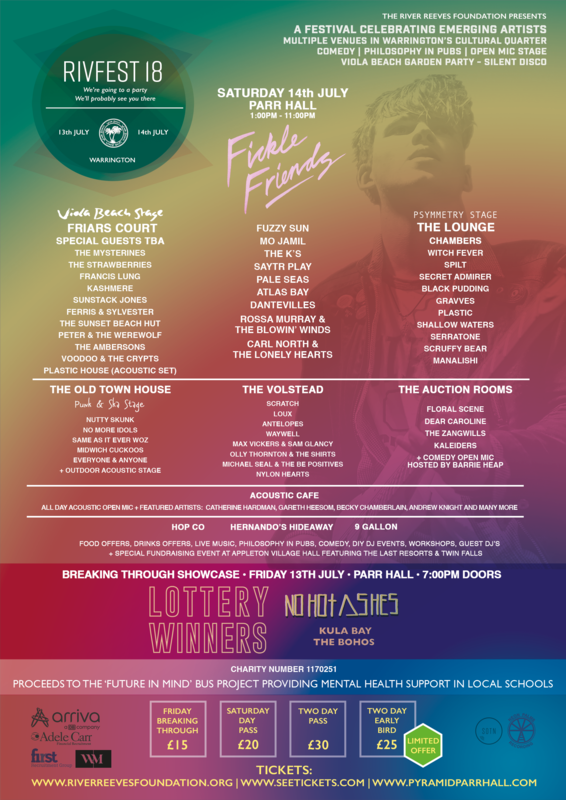 Fickle Friends will headline the event and will be warmly welcomed back to Warrington after opening the main stage at the Neighbourhood Weekender. A band with an electric live show who recently released their debut album on Polydor Records to critical acclaim. Stockport’s Fuzzy Sun recently supported Blossoms on the UK leg of their tour and captivated audiences with their melodic psychedelic synth pop. Their recent “Want Love” EP released on Very Clever Records continues to gain popularity on Spotify and has quickly amassed more than 10,000 monthly listeners. The event, organised by the River Reeves Foundation was set up in memory of the Viola Beach guitarist River Reeves and his band mates Kristian Leonard, Jack Dakin and Tomas Lowe along with their manager Craig Tarry who all tragically died whilst on tour in 2016. Viola Beach were a band with the world at their feet, already receiving a huge amount of attention from a loyal following and the BBC in the form of a Maida Vale BBC Introducing session and Radio 1 playlistings. The band had been selected to play at SXSW in Texas and had headlined a sold-out gig at London’s Koko not to mention support slots with Blossoms and appearances at Reading and Leeds Festivals. In short Viola Beach were going places before their promising careers were cut so tragically short. Rivfest exists to provide a platform for emerging artists and to provide support for talented young musicians looking to take the first steps in their own musical and artistic careers. Each year the River Reeves Charitable foundation awards scholarships of up to £500 to enable struggling or disadvantaged young artists to “create alternate futures”, a phrase coined by Coldplay’s Chris Martin during their 2016 Glastonbury headline set which paid tribute to Viola Beach. Proceeds from Rivfest 18 will go to the “Future in Mind” bus project in partnership with Arriva North-West, providing mental health support in local schools.